In a medium size bowl beat shortening and butter together with a electric mixer. Add sugar, vanilla extract and egg. Mix the flour, baking powder and salt together then add to the creamed mixture. Place dough inside a large zip lock bag and refrigerate for at least 2 hours. Remove dough and let sit on the counter at least 30 minutes. Roll dough on a lightly floured surface until it is about 1/4 inch thick. 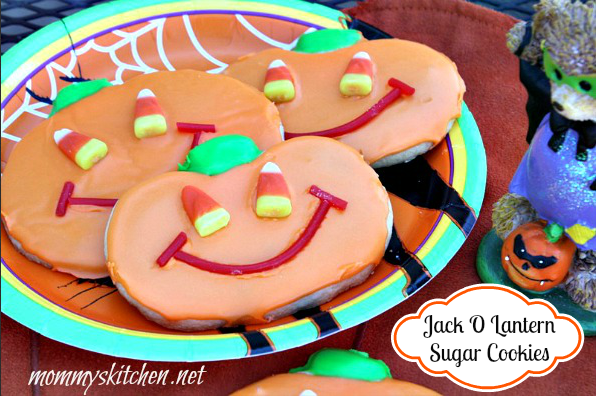 Cut with pumpkin shaped cookie cutter and place on a un greased baking sheet. Bake at 375 for 7-8 minutes or until edges are firm and start to get golden brown. The bottom of the cookies should be light brown as well. Remove from oven and let cool on baking sheet 5 minutes. To make the icing, mix all ingredients together blending with a fork. If too dry, add a little more milk. The icing is thin and pourable, so don't be alarmed. To the remaining icing add a few drops of orange food coloring or icing paste. Spoon over cookies and let the icing run off the sides. Add candy corn eyes and a licorice mouth.